October 17, 2013, 5:02 PM · It's time to throw away the old attitude that orchestral playing is the last resort of a failed soloist. In fact, orchestral violin playing is a competitive field that requires a great deal of training and experience, and for many, it's their first-choice career. "It's a great job to have," said German violinist Martin Wulfhorst, who was not even out of high school when he began his professional orchestra career. "That old idea, that the soloist is the god, and that being the soloist is the only valuable job and playing in the orchestra is some inferior thing -- it's a terrible attitude. We have to reevaluate that completely." To that end, Wulfhorst, who is associate concertmaster of the Hamburg Symphony, has written an encyclopedic, two-volume textbook on orchestra playing for violinists, called The Orchestral Violinist's Companion, which was released this fall by Bärenreiter. "We are highly specialized, very qualified people, artists and craftsmen, who have to know and be able to do a lot," Wulfhorst said. "I think the demands today are higher than ever before in orchestras. We play huge repertoire, from Baroque to cross-over. We play it in many more styles than ever before. It used to be that you just knew how to play Mozart or Brahms; now we have conductors who want anything ranging from something that borders on historically-informed performance practice to something that's really Romantic in style. We have to cover all that, to be able to do all that." Which makes it all the more puzzling to realize how few books have been written on the subject. "There are a million textbooks about conducting, violin playing, shifting, vibrato, piano playing, clarinet playing," Wulfhorst said. "But there's nothing about orchestral playing. It's absurd, isn't it? It's a job without a textbook, which shows again, as I see it, this derogatory attitude towards the job; it implies that it's a job for which you need no special instruction -- you can just 'do it.'" Of course, most of us understand that this is not the case. Orchestra playing requires myriad skills, both technical-musical and interpersonal. "I asked myself, where would you learn something about orchestral playing, if you didn't have the luck of sitting next to a great player, all the time?" Wulfhorst said. He sees the book as both a textbook and a reference for college students, young professionals, experienced professionals, people who do auditions, and even conductors. The book is vast in scope, offering technical exercises and excerpts from 340 works by 87 composers. 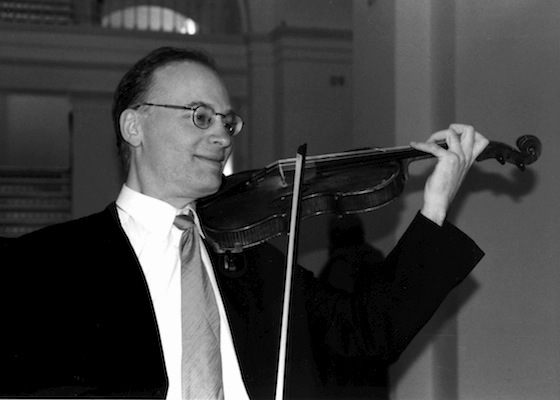 But beyond the many pages of violin technique instruction, Wulfhorst also includes a great deal of practical advise on a wide range of related issues including health, relations with fellow musicians, performance practice, career choices, history of the profession, training and more. How did Wulfhorst manage to gather so much information? For one, he started at an early age. "I was very, very lucky," Wulfhorst said. "During my last years of high school, we were living in Kassel, a city near Frankfurt, (Germany). I got to play as an extra player in the Orchestra of the Staatstheater in Kassel, which is an opera and symphony orchestra. I got to skip school in twelfth grade! (He laughs) So I played symphony concerts and opera performances, and I just loved it. I learned a lot from the older players -- of course, I was the only high school student. I was lucky that I had very, very nice colleagues. It could have been an awful experience, but it turned out to be a great experience. I knew then that I loved playing in orchestra. I loved orchestral music, and I loved the sound of playing in a big section. While studying at the Berlin Conservatory, he played full-time for a year at the Orchestra of the Berlin Opera (Deutsche Oper). "That was a great experience because they had a huge repertoire," Wulfhorst said. "In one season we did about 70 operas and ballets." Did you say 70, as in "seventy"? "Yes, 7-0. It was the old repertory system, where you had a steady cast of singers and a steady repertoire," he said. "There was always a Magic Flute in the repertoire, there was a Flying Dutchman or Traviata in the repertoire -- so I really got to play a lot. But that is what it used to be, in Germany. They had huge repertoires." It was not a situation you play one opera in block, with the same cast, same orchestra, same players, same conductors, and then you go on to the next opera. "Now I think now very, very few opera orchestras have the means to do this huge repertoire -- that really changed." These days, orchestras face a scarcity of rehearsal time, although as Wulfhorst describes it, German orchestras seem to have a lot more than the rest of us. "We're living in paradise in Germany -- when we have a symphony concert, we have usually four days of double rehearsals, plus a dress rehearsal," Wulfhorst said. "That is luxurious by a North American standard." Indeed it is. Many North American orchestras have three rehearsals; with luck, four. "Britain is awful," he said, "when they do a Beethoven 5th they don't even play through!" The fact that the arts are state-subsidized makes a difference in Germany, he said. Without that, the financing for an orchestra can be very volatile, as Americans well know. It just takes one big sponsor going bankrupt; that can pull an orchestra under. And then the implications effect the musical life of the entire community. "Then the culture is gone, there are no more good instrumental teachers," Wulfhorst said. "There are these things that are sort of cross-subsidized when you do have a good orchestra. (Orchestra musicians) do extra things like teaching and chamber music, for fees that they usually couldn't afford to do. So the orchestra culture subsidizes all the other musical areas, including education, which is a very important point." Wulfhorst also spent time in America, where he got a masters at Brooklyn College, studying with Masao Kawasaki and Itzhak Perlman, and a PhD in Musicology from City University of New York. For about 15 years he has been associate concertmaster of the Hamburg Symphony. Mentorship from other orchestra players an invaluable part of Wulfhorst's education, even if he found himself in a "sink or swim" situations at times, playing in professional orchestras at a young age. "It was really taken for granted that if you're a young player, you make mistakes," he said. "The thing was, you would never make the same mistake again. People would see: either you learn or you don't. To be blunt, it's the same in auditions. I've seen people who have made terrible blunders in auditions and got jobs and turned out to be excellent players. I think musicians are pretty smart, in general, that way. They don't want machines; they want people who really can do their jobs very well." These days, what are people lacking, when they show up to their first job? "The biggest problem that many experienced conductors and players sometimes have with the young players, is that we question, do they really want to be in an orchestra?" Wulfhorst said. "Because sometimes we don't get that sense. Sometimes you just feel, when a young player is accompanying Tchaikovsky Concerto, that they're dying because they'd much rather play the solo than the second violin part!" A true orchestra player is someone who can get into what Wulfhorst describes in his book as "Orchestral mode." The most important thing about "Orchestral mode" is responsibility, commitment and respect, Wulfhorst said. "That really guides you in all the aspects of orchestral playing: Respect towards the music, towards the players, the conductor, and the audience." One also needs to be adaptable: to adapt one's playing to circumstances, to the playing of the section, to the playing of the leader, to the acoustics, and so on. "Another important thing is something I call the 80/20 focus," he said. "That means having, at most, 80 percent of your concentration taken up with your playing. You need at least 20 percent to observe and to listen to everything around you, and this is where I think young players often have the greatest deficits, simply because they're not aware that that is a very important principle. "Also, you need a wide range of technical and musical resources," he said. "For example, when you're a soloist, you can pick the kind of spiccato that you like or that sounds best on your instrument. But when you're sitting in the section, you have to the kind of spiccato the section leader wants or the conductor wants. Next, you need 'push-button technique,' which means you have to have all these different kinds of techniques ready and at your disposal at any given moment." "Another thing you need is physical ease, physical endurance, because we are so-to-speak the 'marathon runners' among instrumentalists," Wulfhorst said. "That's very important, and that's also where young players sometimes have absolutely no training. When you're sitting in a, say, Schubert Ninth Symphony, and you've never played it, and you have to do same-day dress rehearsal, concert, if you don't know what it is to really economize, you're dead by the third movement! " And then there are simple things: accuracy and discipline. "You have to be very exact, because everything you do affects everybody else. If you make a mistake, if you're very sloppy with dynamics and so on, it really affects everybody." Last, you need speed and prioritization, which means you have to know what's most important at any given moment, both when it comes to playing and when it comes to other things. "For example, you need to prioritize when it comes to making remarks, asking questions, saying something. That's very important for leaders especially; they have to know when to be quiet and not say anything!" (He laughs) "And when they say something, they have to say something that really helps." Wulfhorst also wrote an entire section in his book on physical health. "I've been pretty lucky; I've always had teachers who came from orchestra background, and they emphasized the importance of posture," Wulfhorst said. "I use a very high chin rest. And that has really saved me, I think, from a lot of wear and tear because it lowers your playing plane. It also moves your ear away from the violin, which is also a very good side effect. It's much better to have a higher chin rest than to have an even higher shoulder rest." "One thing that people should really, really pay attention to is the way they learn pieces. That's the greatest capital we have, I can't stress that enough. It's fine to spend a lot of time practicing these exercises, all the excerpts I have; but more important than that is to think about the way you practice and learn, because that can make the biggest difference to your success and happiness as a player," Wulfhorst said. "Most people practice the way their one favorite teacher taught them, and they don't necessarily question that. What's very important that you develop some kind of routine: how do you learn a piece? And in that process, you also need to find your goal: the idea, how should that piece sound? Because if that goal isn't there, all your practicing is totally in vain." October 20, 2013 at 01:52 PM · "There are a million textbooks about conducting, violin playing, shifting, vibrato, piano playing, clarinet playing," Wulfhorst said. "But there's nothing about orchestral playing." October 21, 2013 at 10:03 PM · I own both of Wulfhorst's volumes and they are like gold to me. I had just been wishing before these came out that something like this would exist, and now it does!!! Brilliant and ingenious. Truly remarkable resources.